Eggless Tutti Frutti cake is a simple sponge cake baked with some colourful tuttifrutti. Perfectly suits for Christmas season. I have prepared this cake around 6 months before and the recipe was in the drafts section and the photos were unedited. So even after christmas it is okay posting this yummy tutti frutti cake. I have prepared eggless version, you could replace it with eggs for more spongy texture and flavour. Simple cake with less ingredients makes the job easy quick but appealing final results. Tutti- Frutti- ½ cup*Do not add Baking powder and Baking Soda if you use Self Raising Flour. Mix baking soda, baking powder and salt with all purpose flour and mix well with a whisk. Beat the yogurt(or eggs)well using beater. And then add the powdered sugar and beat well. Now add the oil or melted butter and mix well. Add the vanilla or pineapple essence; add the all purpose flour mix half a cup at a time and mix well in low speed until the whole lot get finished. Dust the tutti-frutti with 2 tablespoons of flour and add in the batter. Mix gently with a ladle and pour on a prepared(buttered and dusted) cake tin. Preheat the oven to 180 degrees for 10 minutes and bake the cake in 170 degrees for 40 -45 minutes until the skewer inserted comes out clean. 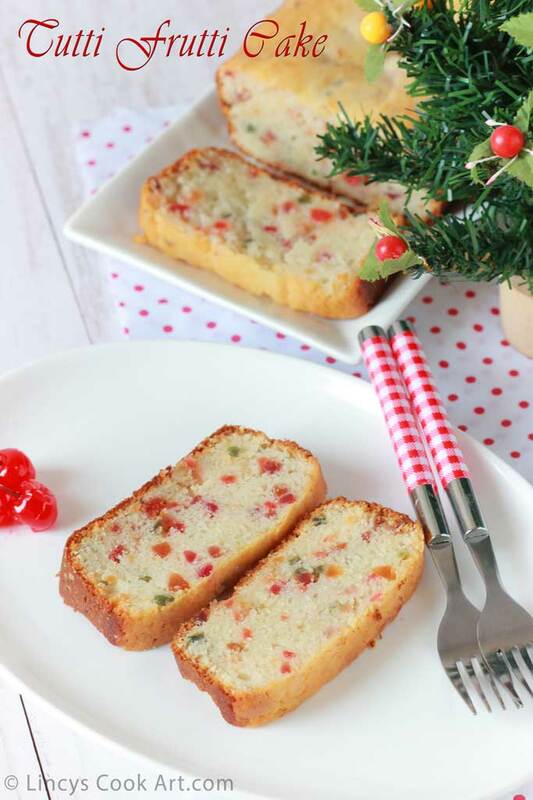 Notes: You could add a teaspoon of mixed spices to give more christmassy feel to this cake.